The City Council is considering two key trash-related bills: one to expand curbside recycling, and another seeking to close the Waimanalo Gulch landfill by 2008. 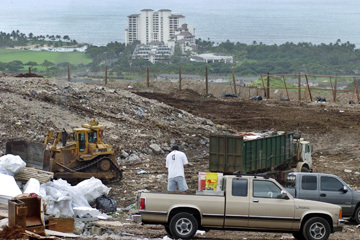 The busy landfill is shown above, with the Ihilani Resort in the background. City Council members told Mayor Mufi Hannemann yesterday to pick up the pace and fix the city's mounting trash problems. Two bills dealing with trash were approved by the Public Works and Economical Development Committee during a special meeting. One bill seeks to expand curbside recycling, which currently targets only yard waste. The other bill seeks to close the Waimanalo Gulch landfill by 2008. They were strong messages for Hannemann, with Council members and the public expressing frustration at his administration's slow pace in tackling the city's trash problems. "We need to get off the dime here," said Councilman Todd Apo, whose district includes the landfill. Environmental Services Director Eric Takamura said that the current administration is doing all it can given the problems left by the previous city administration, and budgetary constraints. "It's going to cost more to reduce our dependency on landfills," he said. Yesterday's hearing comes just days after the state Department of Health fined the city $2.8 million for violations at the landfill. It also comes months after the mayor announced that the city was not going forward with plans made by former Mayor Jeremy Harris to pick up mixed recyclable materials such as newspapers, glass and aluminum cans at curbside. Instead, the mayor decided the city was going to pick up only green waste, which drew the ire of environmentalists. Hannemann has blamed legal challenges for holding up the curbside recycling program. During the meeting yesterday, the committee approved Bill 72,* which requires that the administration begin curbside recycling by next January and that the program include picking up more than just grass trimmings and other green waste. The bill did not indicate what else besides green waste needs to be picked up. The committee also approved an amended version of Bill 37,* which now includes a May 1, 2008, deadline to close the Waimanalo Gulch landfill. Tomorrow, Bill 37 is scheduled for a second vote, and Bill 72 is up for a final vote by the City Council. Because there is no curbside recycling, residents must haul their recyclables to deposit sites, such as the Rolloffs Recycling Truck in the Times Super Market parking lot in Kahala. Takamura said the administration opposed the bills because the measures were directing the administration what to do. But members of the Sierra Club -- wearing dark green T-shirts with the slogan "Got curbside?" -- packed the Council committee room and told the committee that it is time Honolulu joined other municipalities in picking up recyclable materials at the curb, with one testifier saying, "Mufi, get green?" "It's time to act, quite frankly," said Jeff Mikulina, director of the Sierra Club Hawaii Chapter. Devan Rosen, a university professor, testified that sometimes the City Council needs to tell the administration what to do. "We are a bad example as a city. It's a horrible decision not to do curbside." But Takamura said cities cited by environmentalists, such as Portland, Ore., are considered "shining stars" in the world of recycling because of high recycling rates. To which Apo responded, "That's our goal, to be a shining star." 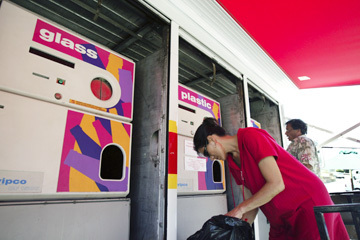 Takamura said the $8 million price tag for curbside recycling could require an additional fee. But others suggested that some in the public might be willing to pay more or even accept replacing one week of regular trash pickup with curbside recycling. Committee Chairman Rod Tam suggested "encouraging" recycling compliance through a fine for those caught not recycling. But while Tam's committee appeared to agree on curbside recycling, it was split on the question of whether to give the administration a deadline to close the Waimanalo Gulch landfill. Takamura said it is "not realistic" to think that the landfill could be closed in a little more than two years. And, he said, Oahu will always need a landfill to dump items that cannot be recycled or burned, such as ash from the HPOWER garbage-to-energy plant. Takamura said the mayor is expected to make an announcement as early as his State of the City address on Feb. 24 on what his plans are for the landfill and solid waste in general. Apo, who lives in Ko Olina just below the landfill, said the previous administration promised that it would be closed by 2008, and the city should not be thinking about expanding it considering the recent fines and violations. He was joined by several Ko Olina and West Oahu residents who called for the landfill's closure. "This leaves me with a major lack of confidence whether we're going to see anything done without a definite date in place," said Cynthia Rezentes, chairwoman of the Waianae Coast Neighborhood Board. "The only thing that is going to work now is a hard deadline," Okino said. » Bill 37, which mandates the closing of the Waimanalo Gulch landfill by May 1, 2008, is scheduled for a final vote at today's City Council meeting. Bill 72, which mandates curbside recycling of green waste and other recyclable materials by Jan. 1, needs two more Council approvals. A story on Page A1 yesterday incorrectly reported the status of each bill.